Laptops, PCs and screens may be the crux of traditional presentations and digital signs but iPads are quickly joining the line-up. 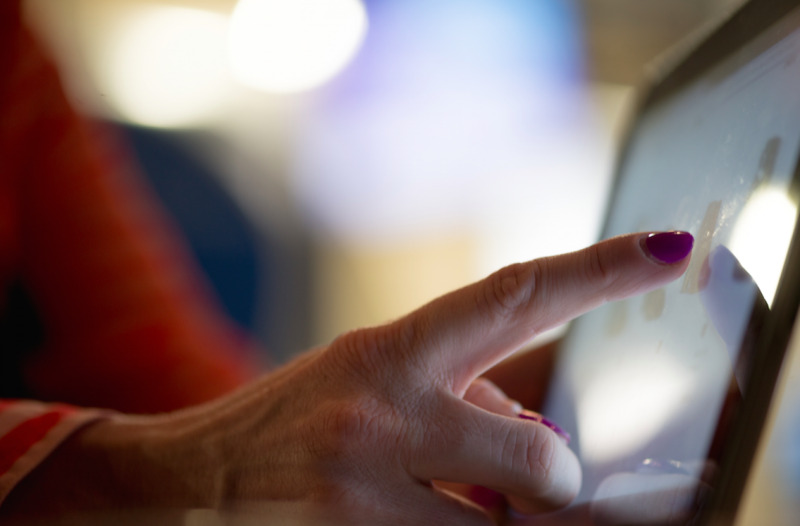 Familiar and with a wealth of benefits that come with being connected to the Apple App Store, the iPad is a strong contender for your digital signage display. If you’re holding a presentation or event the iPad fits in your hand as a gateway to your website, images, videos and social media. Fix it in place with a tool such as a Bouncepad and you have a powerful digital sign within your store, hospital or school. The first thing people ask about using an iPad as a digital sign: is an iPad commercially reliable? The truth is, traditional digital signage displays stick to what are called ‘commercial grade’ TV screens. These are (expensive) screens specifically built to be used within a commercial setting such as a large retail store or train platform. The benefit of commercial grade is that the technology is built for an ‘always on’ environment with longer manufacturer warranties and a higher tolerance for dust, heat, cold and the like. However, whilst the traditional Apple iPads aren’t build for commercial use, they still do the job very well. iPads are much cheaper than commercial grade screens or tablets and can usually be picked up from your local department store. They come in a range of colours, sizes and memory capacities so you tailor for your own design and usually for less than $500! The Retina screen of an iPad makes content look amazing and super sharp! The smaller screen also draws attention. People are used to seeing large screens everyday, but the iPad is still somewhat of a novelty and you'll find visitors can't take their eyes off them! Small screens such as iPads are great at counters where people are queuing such as a bar or till as they allow the customer to be right up close to the action. The iPad doesn’t fully support offline mode. It only has media caching capability, which means that if the connection drops, only images and video will show up. Any apps you've chosen from our App Store (Twitter, Weather etc.) will show as black on screen. Now I know what you’re thinking. This sounds great and I can live with the cons, but how do we connect our content with the iPad? Where’s the HDMI plug in? Can I add a VGA? I’m going to need an adaptor at least. Open up the app store on your iPad and search ‘ScreenCloud’. Once you see our lovely app icon you’re ready to download. Launch the app on your iPad and you’ll immediately see a six-digit pairing code that looks like the below. 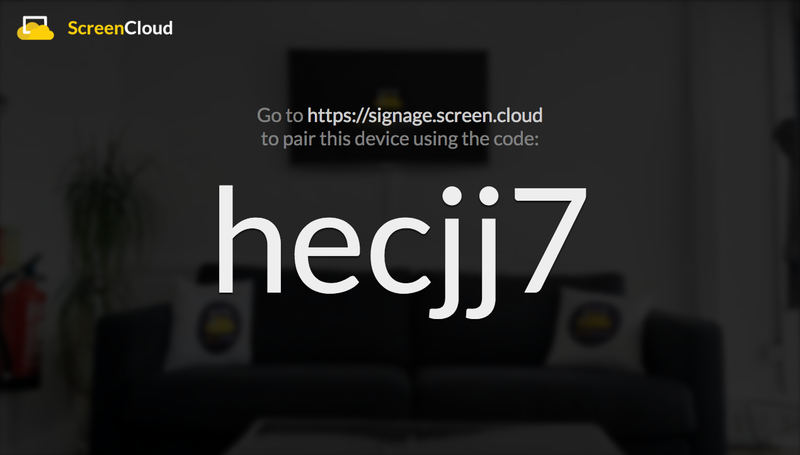 Next, head over to screen.cloud/signage and sign up for a free trial (or log in if you already have an account). Once logged in, click the ‘add screen’ box that’s third along in the diagram below. This is where you’ll enter the pairing code and voilà! Your iPad is being controlled from your laptop allowing you to change and add content whenever you like! Apps - Social Media Feeds, Rss, News, Weather etc. Once you’ve uploaded any content you want to display there are a myriad of options that you can choose from, including how long to show each piece of content for, where to show it within your playlist and what time you want your content schedule to run. Note that ScreenCloud also optimizes all content for display. This will take a few seconds for images or several minutes for videos and will ensure that your screens look picture perfect! 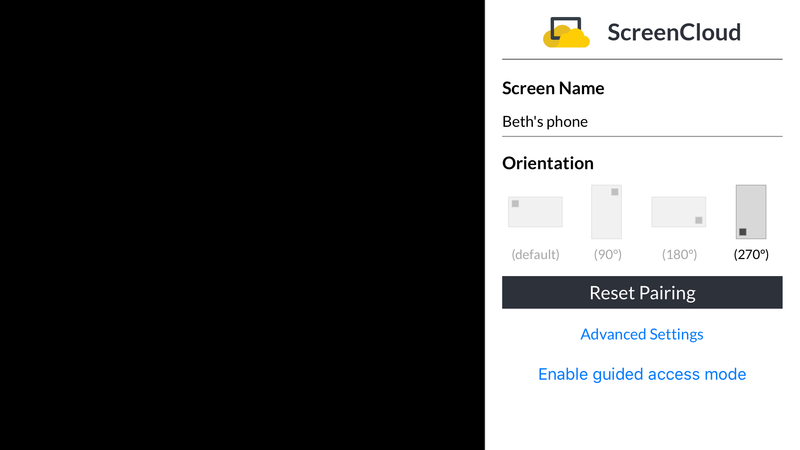 If you want to change the settings of your screen, for example to change the name of your screen, or the screen orientation, simply press and hold down on your iPad screen and you’ll access the settings panel which looks like the below. If you want to set your iPad up for longer term use you can use the iPad settings panel to enable guided access mode. This allows your iPad to stay on task and will ensure that only ScreenCloud is able to run while you’re using your iPad as a digital sign. This is great if you’re using your iPad to display content in a fixed setting - such as your reception or at an event as you won’t have Twitter notifications popping up every five minutes. It also means that the hardware buttons become disabled so anyone wanting to change the screen display will need to enter a password - great for prying (and little) fingers that may be itching to mess with your display. If you want to use your iPad to control your TV screen (still running ScreenCloud) you might want to use AirPlay Mirroring. AirPlay Mirroring allows you to clone the entire home screen on an iPhone and iPad to your TV screen. To set this up with ScreenCloud, simply start ScreenCloud on your iPad then turn on AirPlay mirroring. Here’s a tip you weren’t expecting. You can use the exact same process to turn your iPhone into a digital sign too! In fact, any iOS device you can lay your hands on can easily become a digital signage display using the iOS ScreenCloud app.